Have a wonderful break Rochelle.. an intriguing story.. those glass-eyes probably had a sheen of itself… I will soon leave for a break too. so we’ll see if I decide to post for this one. I’ll still be lurking a bit. Enjoy your break, too. I remember this story. I liked it then and I like it even more now because it brings back memories. There were only about 45 regular writers in FF and yet, because that was more than double the original numbers of the charter members, we thought things were getting out of control. Enjoy your guests and your well deserved time off. 45? Who knew it would almost triple? I’m so glad that some of those longtime FF’rs such as yourself have stuck around. Without your moral support I don’t know how I would’ve made it through at times. This story is near and dear to my heart for a number of reasons. Thank you for stopping by. Safe travels, my dear friend. I’m glad you stayed with it long enough for me to join. I am taking a 90% break myself, so I won’t be doing them in this time either. Enjoy your time off Rochelle. Enjoy your break, too, Al. Thank you on both counts, Amanda. Great story. Enjoy your well deserved break. Thank you, FF. I’m looking forward to a brief respite. But I’ll be back to my fictioneers family. Merci on both counts, Cher Elephant. Somehow “Hi” lost its “H” to become “i” in the beginning ! i’ll still be lurking but not quite as active for a couple of weeks. I’m pleased you liked my story. I remember having a lot of fun with it at the time. Just a few more hours until my vacation officially starts. I need to dig through my files and unearth my two year old story. You could always write a new one, JK. Thanks for dropping by. I enjoyed going back in time reading the stories I’d shared two years ago and I actually liked the original better than the idea I’d come up with for a new story, so I reposted the original. Cool exercise, tho! I go back and read the old ones from time to time. It’s fun to see who commented and what they said. This one being my fourth one when I was still the new kid on the block. And I still rank this story in the top ten of my favorites out of over a hundred. So far, I’m enjoying the break and my company. I’m pleased you like my story. It’s still one of my favorites for many reasons. It seems we all need a break. I missed the last two weeks and I’ll be missing this one also. I’m finishing up a renovation project that is taking all of my free time then leaving for a camping trip this weekend. Hopefully I can return next week refreshed and with no more renovations in the near future! Enjoy your break! I’d say you more than earned it. Thank you and enjoy your break. Hi Rochelle, I’m not very old in FF so creepy story coming from you surprised me. Have a nice time dear. I might add that it’s lovely to have you as part of our group. In your willingness to learn I’ve watched you grow as a writer and I always appreciate your kind words and support. This story actually surprised me a little. I never know for sure where the muse will take me which makes writing such a thrill. It worked very well Rochelle. The end shocked me. Thanks for such kind words dear. I wonder how much the ruby is worth and who is the woman. Enjoy your time with your visitors. Oh, I get who the lady was! I’m a little slow in the mornings and I need sun badly. We’ve had almost forever rain and clouds. Apparently the ruby was worth enough to her to lose her life. 😉 I am enjoying my visitors. Rochelle, you are such a dear, sweet lady, with an extraordinary imagination and truly the hostess with the mostest. Have a wonderful vacation and thanks for all your work for Friday Fictioneers! I’ll admit to enjoying the break. This story still ranks among my top ten favorites of over 100 flashes I’ve written in the past two years. Exactly the point. I wanted to wall up my victim but thought about the smell. So how could she not? He stuffed her. 😉 Then I thought “taxidermy.” So I googled “taxidermy, human” and, voila, came up with this. I am enjoying my time. I, too, expected the ring but not the bearer. Nice (?) surprise. There was a rash of walled up body stories that week. But I think I had the only ruby ring. 😉 It was a fun write. What a spooky story! Is it true? Often your tales come from history itself. I could almost see this one happening for real. Great story Rochelle! In the end, I guess he wasn’t a pauper after all. I’ll keep this short – you have better things to do! Enjoy your break, and thanks for still hosting even while you’re away from us. Don’t take this the wrong way, but I often find looking back shows me how much I’ve grown as a writer. I enjoyed this story, and can find no fault with it, but I think your more recent pieces are even richer and more powerful. This is good stuff though, and a lovely grizzly surprise at the end. Good friends. I’ve hardly been online in the last 24 hours. well done! well done! i do believe my dark side is rubbing off on you Rochelle:) loved the shocking ending! i laughed out loud. one last thing she can shove in her mouth. I wrote this one two years ago. 😉 Dark side already in place. I have to let this morbid little muse come out to play every so often. It keeps people on their toes. I guess it’s more dark humor than historical fiction and I’m glad it made you laugh. Taxidermist husband, disgruntled mail-order bride longing for an old flame, final battle over missing ring….I love it when I have to tease out the details to understand the story. You did an excellent job. Sorry I missed it the first time around. Better late than never. 😉 Yes, you caught it all. I had a blast writing this one. I just loved this. I wanted to be angry at her, then not so much. 😉 Excellent imagery. I guess i didn’t have a lot of sympathy for her. I saw her as something of a shrew. I’m glad you liked. Rochelle, this isn’t a re-run for me. I wasn’t with you until about August or September. This is a great story to return to. I love the ruby ring clenched between her teeth. That’s quite a visual! Enjoy your guests! Oh, you so deserve a break! Don’t worry about a thing here. This is still one of my faves. I had a blast researching and writing for it, ie how would the body not have offered up an unholy stench? Glad you liked. Hm. Seems like you’ve always been an FF’r. I know, right? The time seems to just fly by! I think my 2-year anniversary with FF will be sometime in September. I’ll have to check. Thanks again for all your time. You are such a shining light for all of us. An amazingly dark story. Taut and brilliantly narrated. It knocked the stuffing out of me! I’d run, too. But since I’m the author I’m fearless. Ha! I thought that photo looked familiar. I don’t think I wrote one that time. Your story still stands as a good one, R.
I enjoyed your telling of this story. I’ve read other versions of this in the past from other authors, and the details are so amusing. I also like the retread idea. It’s a great way to give yourself a break while keeping the action alive in the blogosphere. Have a great time with your visitors! I’ve gotten better at stepping outside the box since then. 😉 Glad you enjoyed. Having a blast with the visitor. She wasn’t in Kansas anymore (or maybe she was!) Enjoy your break and who says you can’t go back again? You just did. This retro and your visit have been fun. have a wonderful weekend celebrating some time for yourself and sharing with your friends, Rochelle. you kept me wondering what would happen to that mail-order bride . . . she should have been grateful but guess it’s hard when the marriage was somewhat arranged. I have a hunch the mail-order bride did it for the money and when things didn’t turn out the way she imagined…well..you get the picture. Having a lovely time and am very slow to answer or get around this week. Well…good news is, at least they found the ruby! 😉 Hope you have a great, relaxing weekend! No doubt that was an inheritance J.T. III didn’t anticipate. She hadn’t abandoned, she was made to abandon with the ring… what a chilling tale, Rochelle! 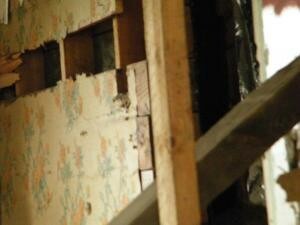 Something about old wallpaper just makes for a good scary story. I figured she didn’t just leave her husband and son, and so figured she must have ended up in that wall… but the ring in her teeth, oooh, so creepy! The image really stays with me. Another good one, Rochelle! I hope you enjoy some much deserved time off with your friends. As I recall, the first time around, that photo spawned a few walled up body stories. I am enjoying my company. Enjoy your travels. The oldies are just as good, then? Wow. There’s your comment after all. it must have been hiding. Excellent! And very dark for a Rochelle story—loved it! I guess the message is…love it…or…you’re outta here, like permanently. The best, as always, Rochelle. I have the feeling that old Jefferson Thomas had enough whining. 😉 Nothing worse than being reminded that you weren’t the first choice. What a great story, Rochelle. The ending came as a complete surprise, and I can’t believe I missed the clues. Clever writing. Love to put in a twist whenever I can. My goodness that’s spooky! ! ! I tried for spooky this week but yours has hit it out of the park! Enjoy your break. I think a flashback is a brilliant idea for when you have a much-needed rest. Thank you, Jessie. Yes, I am enjoying a bit of a break. What an ending! Enjoy your break and your company. What a great story! Not quite the best way to meet an ancestor. Thanks for hosting this exercise, and enjoy your break! Hi Rochelle, I very much enjoyed your story! I wrote my story and linked to your site on my blog. I also used your linking process, and the link works – not sure why my gravitar didn’t show up in the link, however. Thanks for hosting the Friday Fictioneers. 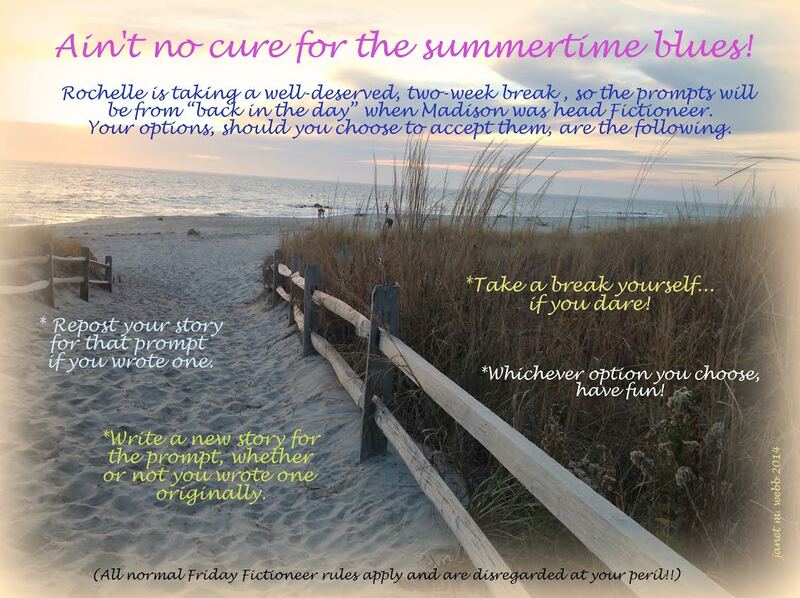 It’s great fun to try to think fo a story based on the photo prompts chosen. It’s hard to say why your gravatar didn’t work. Gremlins? At least your story posted. .
Friday Fictioneers is very special to me and hosting is my pleasure. My story is still one of my favorites after writing and posting over 100 thus far. Oh my, I was expecting a normal history piece and found a delightful bit of beautiful horror fiction! What a lovely surprise! Perhaps the historical fiction tag is misleading. Lovely surprise? Oh my. Great story even though Grandma turned out to be a mummy (just like any TV soap worth it’s salt). And looks like Grandpa carried his secrets with him. Hopefully her gift of the ruby ring will help him through the rough time. No doubt the ring will assuage any grief. 😉 Thank you for your spamming comments. Always welcome. Clever story Rochelle, great visual image at the end. I love a good horror story. Enjoy your break. Glad my story worked for you. I am enjoying something of a respite, thank you. Enjoy your guests and taking a break. This was a new story for me and such a good one to show the passing of time and how much you can get into 100 words. I’m left wondering if Jefferson’s wife is related to the shrew in the cellar in Doug’s story. I found it really hard not to follow in your wake, Rochelle, and have a walled-in person or else take Mr. Poe’s cues for a tell-tale something in the wall/floor. 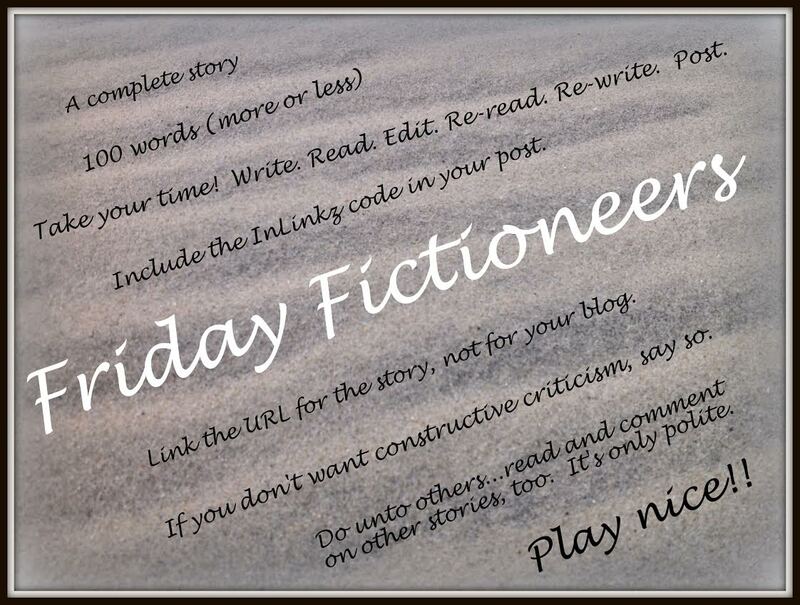 Anyway, I wrote a long FF (190-something), yet again, that I won’t link up but I’ll mention here in case someone wants to take a gander (http://leighswordsmithery.wordpress.com/2014/06/24/friday-fictioneers-meditations-museum/). I love writing these; thanks for providing the “kin’lin,” Rochelle! Hope you’re enjoying the time off as I write this! I’m enjoying a bit of a respite with a good friend. The ruby clenched between the teeth was a bit scary. Do take a well-deserved vacation Rochelle. will miss you.